Purpose: The purpose of this study was to compare and correlate sagittal condylar guidance determined by intraoral gothic arch tracing method and panoramic radiograph in edentulous patients. 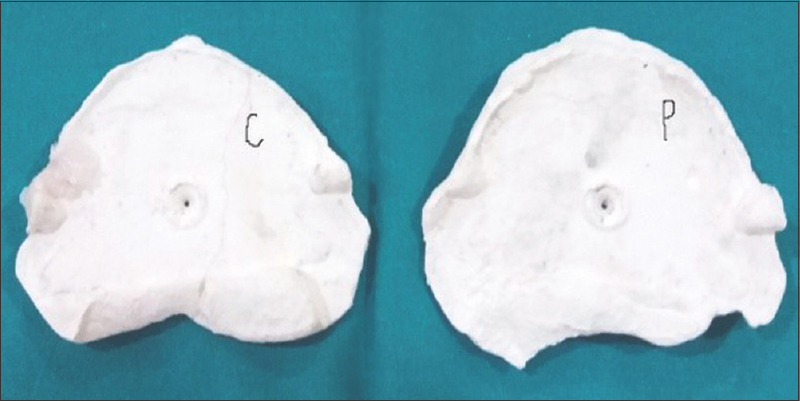 Materials and Methods: Twelve completely edentulous patients were selected by the inclusion and exclusion criteria. Conventional steps in the fabrication of complete denture till jaw relation were carried out. Intraoral gothic arch tracing and protrusive interocclusal records were obtained for each patient. 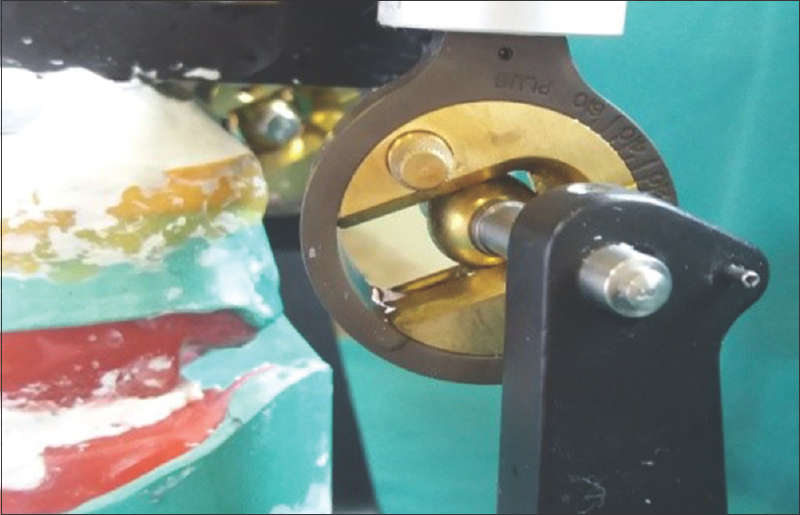 Protrusive interocclusal record was used to program the Hanau Wide-Vue semi-adjustable articulator, thus obtaining the sagittal condylar guidance angle. Using RadiAnt DICOM software, on the orthopantomogram obtained for each patient in the study, two reference lines were drawn. The Frankfort's horizontal plane and the mean curvature line (joining the most superior and the inferior points on the glenoid fossa curvature) were drawn. The mean curvature line was extended to intersect the Frankfort's horizontal plane, thus obtaining the radiographic sagittal condylar guidance angle. The condylar guidance angles obtained by these two methods were compared and subjected to paired t-test. Results: There was no statistically significant difference between the sagittal condylar guidance angles obtained between right and left sides with intraoral gothic arch tracing and radiographic methods (P = 0.107 and 0.07, respectively). Conclusion: Within the limitations of this study, it was concluded that the protrusive condylar guidance angles obtained by panoramic radiograph may be used for programming semi-adjustable articulators. To create optimum esthetics, function and phonetics in complete denture fabrication, it is necessary to record accurate maxillomandibular relationship. Any errors made while taking maxillomandibular jaw relation records will result in dentures that are uncomfortable and possibly, unwearable. The methods used for recording centric relation can be classified as (1) static, (2) graphic, (3) functional, and (4) cephalometric. Among these, interocclusal wax record (static) and the graphical methods are the most commonly used methods. Gothic arch tracing is the most commonly used graphic method and is considered as the ideal method in programming the articulator. It is one-dimensional graphic tracing method usually recorded in horizontal plane and can be recorded intraorally and extraorally. Intraoral tracing (Gothic arch tracing) is a preferred method of obtaining consistent positions of the mandible in motion (retrusive, protrusive, and lateral) at a comfortable VDO. This is based on the concept of attaching a stylus (Central Bearing Pointer) to one occlusal rim and a plate (Central Bearing Plate) to other rim. The stylus traces or marks the path in the plate as the mandible performs excursive movements from the centric position. The tracing is typically in the shape of a “gothic arch” or arrowhead. However, it is difficult to use gothic arch tracing method in cases of decreased interarch space, temporomandibular joint (TMJ) arthropathy, abnormal jaw relation, severely resorbed ridge, and excessive flabby ridges., Hence, an alternative method of radiographs is used to obtain sagittal condylar guidance angle. Orthopantomographs (OPGs) are one of the commonly used radiographs to determine condylar guidance angle. The outline of the articular eminence and the glenoid fossa of the temporal bone have been evaluated on the panoramic radiographs, and it is proposed to be of valuable aid in setting the condylar guidance in semi-adjustable articulators. The use of panoramic radiographs can overcome the shortcomings of the conventional clinical methods used to determine the condylar guidance. The clinical implication of these studies needs to be compared for reasonable accuracy. Therefore, the main aim of this study is to evaluate the feasibility to use the panoramic radiographs to determine the condylar guidance in comparison with the conventional clinical methods for reasonable accuracy. The sample size 12 was selected based on standard deviation of 3.9, precision of 2, and confidence level of 95%. Twelve edentulous patients reporting to the Department of Prosthodontics of Yenepoya Dental College who gave consent to participate in the study were selected based on inclusion and exclusion criteria. Gross asymmetry of the face. Conventional steps in the fabrication of complete dentures were carried out till jaw relation. Hanau Wide-Vue semi-adjustable articulator along with Hanau ™ Springbow (Whip Mix Corporation, USA) was used in this study. Facebow registrations were accomplished using the standard technique, and maxillary cast was mounted using indirect technique. After tentative jaw relation, mandibular cast was mounted to articulator using centric relation record, and the intraoral tracers were attached to the occlusion rims. Center-bearing plate on maxillary occlusal rim and center bearing point on mandibular occlusal rim were attached. The patients were trained to give the intraoral gothic arch tracings, and interocclusal records were made with quick setting dental plaster [Figure 1]. The centric locks and the horizontal inclinations of the condylar guidance on the articulator were loosened before programming the articulator. The protrusive interocclusal records were used to program the articulator, and the record was seated onto the lower occlusal rim, and the upper member was guided onto the imprint of occlusal record. The right and left condylar guidance were rotated back and forth to accurately seat the upper and lower rims into the protrusive relation record. Before tightening, the thumb net for horizontal inclination, we made sure that the occlusal rims were seated properly without rocking; and then, protrusive relation record was removed. Thus, condylar guidance on both the sides of articulator was set [Figure 2]. The right- and left-side condylar guidance angles were tabulated for all the 12 patients. An OPG was made for each patient. For measuring the condylar guidance angle, RadiAnt DICOM software was used. On this OPG, two reference lines were drawn, the first reference line was Frankfort horizontal plane drawn on the right and left sides. The second reference line was drawn by joining the most superior and most inferior point on the glenoid fossa curvature, and this line was extended to intersect the Frankfort's horizontal plane to obtain radiographic condylar guidance angle [Figure 3]. The condylar guidance angle obtained by these two methods was evaluated using descriptive statistics and comparison between the data obtained was done using paired t-test. [Table 1] shows the condylar guidance angles and standard deviations measured by the radiographic and intraoral gothic arch tracing methods. [Table 2] shows the correlation between the condylar guidance angle measured by intraoral gothic arch tracing method and radiographic method. The comparison of mean condylar guidance angles between the right side of the intraoral gothic arch tracing method and radiographic method and the left side of the intraoral gothic arch tracing method and radiographic method (P = 0.107 and P = 0.007, respectively) were not statistically significant (P < 0.05). In the present study, a significant positive correlation was observed between the condylar guidance angle acquired using intraoral gothic arch tracing and radiographic methods for both right (P = 0.107) and left sides (P = 0.07). These findings were in accordance with the studies done by Weinberg  and Gilboa et al. as they reported a high degree of correlation between articular eminences anatomically and radiographically and suggested that the inclination of the articular eminence in a panoramic image may coincide with the anatomic articular eminence. They also stated that compared to clinical methods, radiographic measurement has the advantage of using stable bony landmarks and ability of being standardized and repeatable. In contrast to this, Christense and Slabbert  and Brewka  in their studies have concluded that radiographically obtained sagittal condylar guidance always has a greater mean value than intraoral/clinical technique. They stated that the important reason for the inconsistency of intraoral methods may be that, regardless of the material used, horizontal condylar angle changes with the degree of protrusion, and the intraoral record represents only one point along the condylar path. Furthermore, the difference in the results of their study with that of the present study could be the method used to derive condylar guidance angle on the radiograph which was digital using a software in this study as against manual method used by them. Galagali et al. also reported a correlation between the condylar guidance angles obtained by protrusive interocclusal records, panoramic radiograph, and the lateral cephalogram radiograph methods. They found that lateral cephalogram radiographs were more positively related than the panoramic radiograph, and the values of lateral cephalogram radiographs were closer to the interocclusal records on the articulator as separate radiographs for the left and right side were taken, making the amount and quality of image distortionless. The average condylar guidance angle obtained in this study by the intraoral gothic arch tracing method was 26.33° on the right side and 26.67° on the left side. The mean condylar guidance angles obtained using the radiographic method was 28.77° on the right side and 29.48° on the left side. In support of these results, el-Gheriani and Winstanley  and Zamacona et al. have also reported significant variation between the left and right condylar guidance angles. This is because the right and left eminences seldom have exactly the same slants, contours, and declivities. In contrast to this, a bilateral symmetry of the right and left sagittal condylar guidance angle (31°) on both sides has also been reported using protrusive interocclusal records in a study by Donegan and Christensen. Although significant correlation between the two methods showed that panoramic radiographic method may be used to set the condylar guidance values on the semi-adjustable articulator, further research should be done to give us more reliable and insightful conclusions using a larger sample size than the one used in this study. Within the limitations of the study, it can be concluded that the correlation exists between the condylar guidance angles obtained by radiographic method and intraoral gothic arch tracing method. This suggests that, for programming of semi-adjustable articulators, panoramic radiographs can be used as a viable option to obtain condylar guidance angle in cases where intraoral gothic arch tracing method is difficult to perform. Herbert S. Phonetic capability as a function of vertical dimension in complete denture wearers – A preliminary report. J Prosthet Dent 1970;23:621-32. Zarb GA, Bolarder CL, Hickey JC, Carlsson GE. Boucher's Prosthodontic Treatment for Edentulous Patients. 10th ed. St. Louis: The C.V. Mosby Company; 1997. p. 283, 270, 422. Villa H. Gothic arch tracing. J Prosthet Dent 1959;9:624-8. Posselt UP, Franzen G. Registration of the condyle path inclination by intraoral wax records: Variations in three instruments. J Prosthet Dent 1960;10:441-54. Venkateshwaran R, Karthigeyan S, Manoharan PS, Konchada J, Ramaswamy M. A newer technique to program a semi adjustable articulator. J Pharm Bioallied Sci 2014;6 Suppl 1:S135-9. Gilboa I, Cardash HS, Kaffe I, Gross MD. Condylar guidance: Correlation between articular morphology and panoramic radiographic images in dry human skulls. J Prosthet Dent 2008;99:477-82. Instruction maual of Hanau spring bow, product number 010328-000, waterprick technologies, USA. Weinberg LA. An evaluation of basic articulators and their concepts part I and II. J Prosthet Dent 1963;13:645-63. Christensen LV, Slabbert JC. The concept of the sagittal condylar guidance: Biological fact or fallacy? J Oral Rehabil 1978;5:1-7. Brewka RE. Pantographic evaluation of cephalometric hinge axis. Am J Orthod 1981;79:1-9. Galagali G, Kalekhan SM, Nidawani P, Naik J, Behera S. Comparative analysis of sagittal condylar guidance by protrusive interocclusal records with panoramic and lateral cephalogram radiographs in dentulous population: A clinico-radiographic study. J Indian Prosthodont Soc 2016;16:148-53. Aull AE. Condylar determinants of occlusal patterns. J Prosthet Dent 1965;15:826-49. Donegan SJ, Christensen LV. Sagittal condylar guidance as determined by protrusion records and wear facets of teeth. Int J Prosthodont 1991;4:469-72. White SC, Pharaoh MJ. Oral Radiology: Principles and Interpretation. 6th ed. St. Louis: Mosby; 2008. p. 175-7. Langland OE, Langlais RP, Preece JW. Principles of Dental Imaging. 2nd ed. Philadelphia: Lippincott Williams & Wilkins; 2002. p. 202. Stramotas S, Geenty JP, Petocz P, Darendeliler MA. Accuracy of linear and angular measurements on panoramic radiographs taken at various positions in vitro. Eur J Orthod 2002;24:43-52. Gray RJ, Quayle AA, Horner K, Al-Gorashi AJ. The effects of positioning variations in transcranial radiographs of the temporomandibular joint: A laboratory study. Br J Oral Maxillofac Surg 1991;29:241-9. Mohl ND, Zarb GA, Carlsson GE. A Textbook of Occlusion. Chicago: Quintessence; 1988. p. 139-40. Davis DN, Mackay F. Reliability of cephalometric analysis using manual and interactive computer methods. Br J Orthod 1991;18:105-9. Shetty S, Satish Babu CL, Tambake D, Surendra Kumar GP, Setpal AT. A comparative evaluation of condylar guidance value from radiograph with interocclusal records made during jaw relation and try-in: A Pilot study. J Indian Prosthodont Soc 2013;13:321-6. Thakur M, Jain V, Parkash H, Kumar P. A comparative evaluation of static and functional methods for recording centric relation and condylar guidance: A clinical study. J Indian Prosthodont Soc 2012;12:175-8.